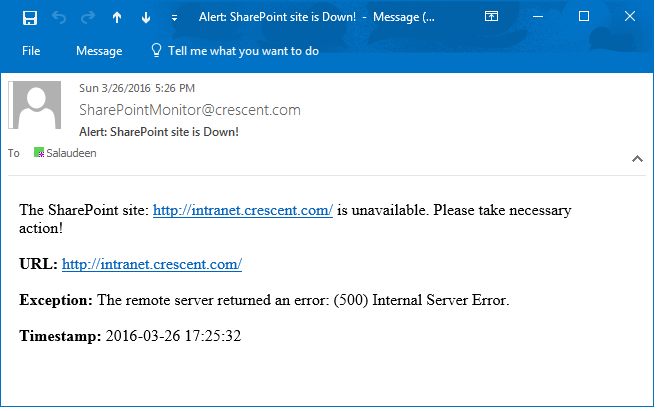 Requirement: Script to monitor SharePoint web sites and Trigger an Alert Email when something goes wrong! 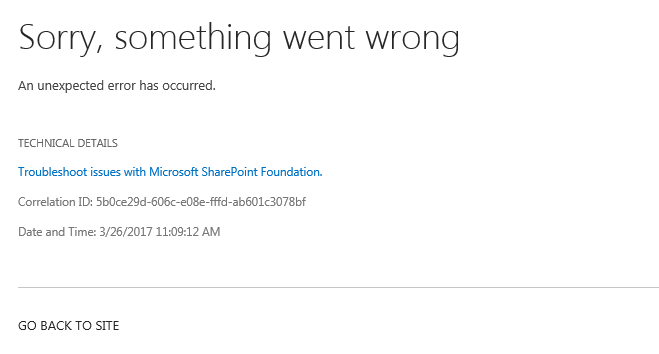 $EmailSubject = "Alert: SharePoint site is Down!" $TimeStamp = Get-Date –f "yyyy-MM-dd HH:mm:ss"
$EmailBody += "The SharePoint site: $($WebApp.Url) is unavailable. Please take necessary action!<br><br>"
$EmailBody += "<b>URL:</b> " + $WebApp.Url + "<br><br>"
$EmailBody += "<b>Exception:</b> " + $_.Exception.message + "<br><br>"
Schedule this script in Windows task scheduler to run for every 10 minutes. Update: What if the site loaded with an error? E.g. "Sorry, something went wrong" error message. $EmailBody += "The SharePoint site: $($WebApp.Url) encountered with an unexpected error. Please take necessary action!<br><br>"
You can add few more probable error messages such as: "cannot connect to the configuration database", "Server error", etc. Send-MailMessage: The remote certificate is not valid according to the validation procedure. make sure your code uses: -usessl parameter. Add your SharePoint server to the relay list in Exchange server.